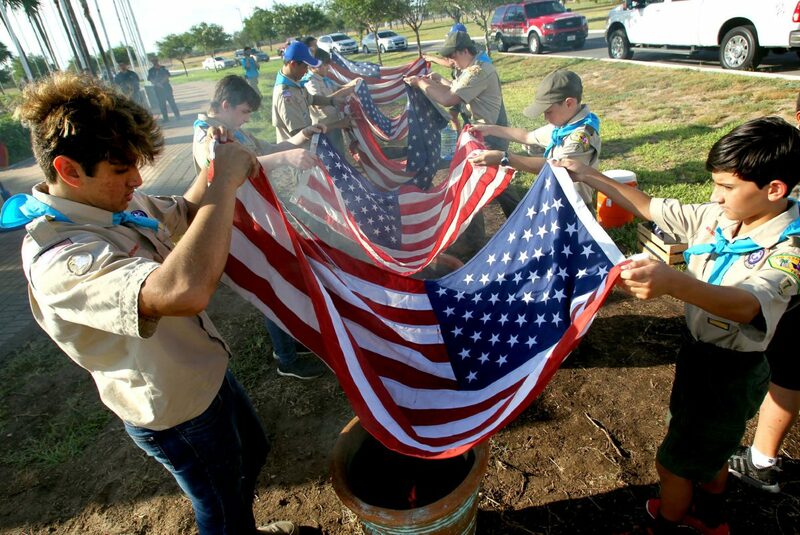 The Boys Scouts of America Troop 7 of McAllen retired American flags during a retirement ceremony at the McAllen Veterans War Memorial on Thursday, June 14, 2018 at in McAllen. Over 300 American flags were collected by William Webber III as part of his Eagle Project. McALLEN — Two boys held a tattered American flag above a clay pot with burning charcoal, the flag’s red stripes looking pink, the blue looking gray, each of the stripes its own hanging ribbon. The younger boy gathered the stripes in his hand, and together, they gently lowered the flag into the fire. This was the scene at the Veterans War Memorial in McAllen on Thursday evening, as Boy Scouts Troop 7 held an official American flag retirement ceremony. The McAllen Fire Department, veterans and families watched as the scouts retired approximately 20 flags. 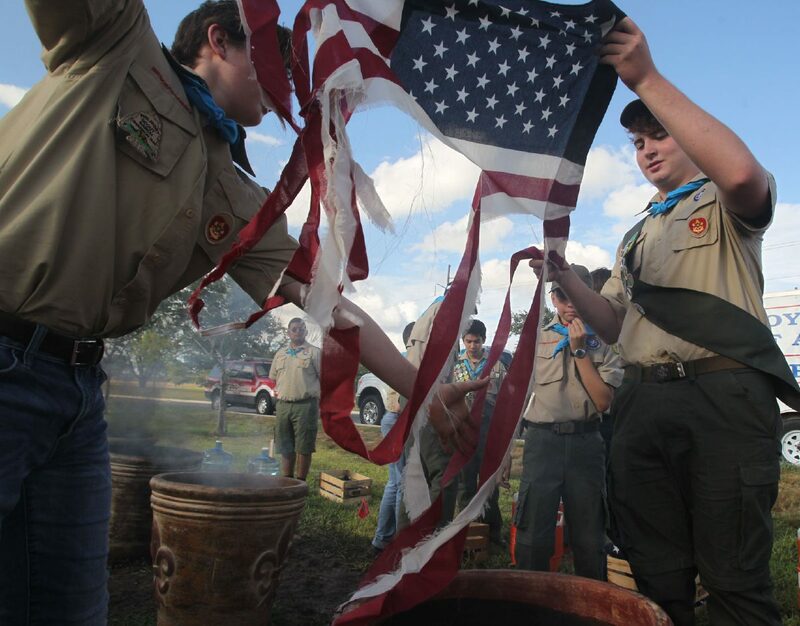 Nick Nelson, 16, and Gavin Ochoa, 11, with the Boys Scouts of America Troop 7 of McAllen retired American flags during a retirement ceremony at the McAllen Veterans War Memorial on Thursday, June 14, 2018 at in McAllen. William Webber III along with the Boys Scouts of America Troop 7 of McAllen retired American flags during a retirement ceremony at the McAllen Veterans War Memorial on Thursday, June 14, 2018 at in McAllen. 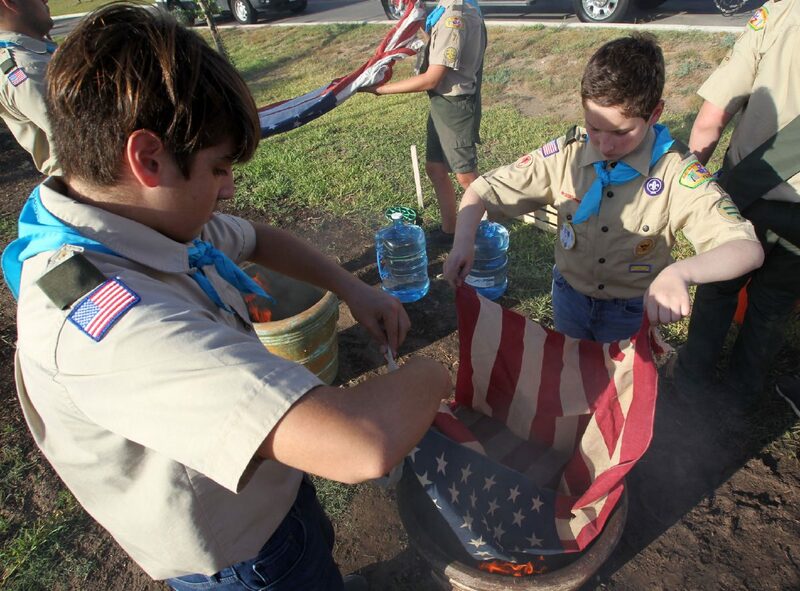 Diego Nelson, 13, and Linus Flores-Araujo, 13,of with the Boys Scouts of America Troop 7 of McAllen retired American flags during a retirement ceremony at the McAllen Veterans War Memorial on Thursday, June 14, 2018 at in McAllen. 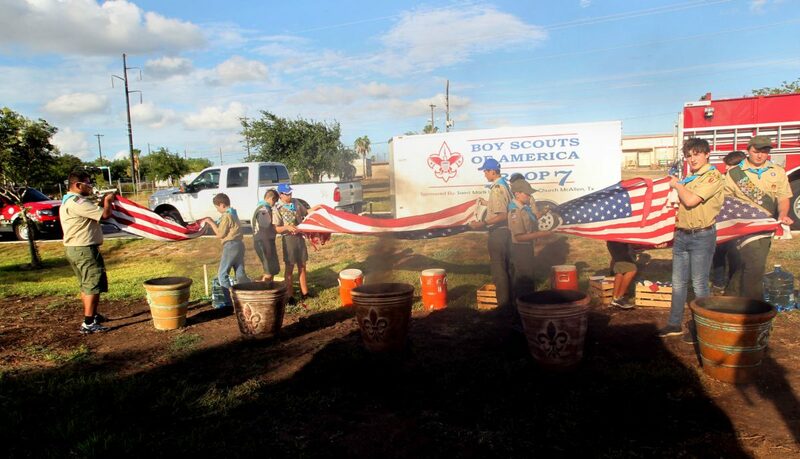 The Boys Scouts of America Troop 7 of McAllen retired American flags during a retirement ceremony at the McAllen Veterans War Memorial on Thursday, June 14, 2018 at in McAllen. When the United States flag (Old Glory) becomes worn, torn, faded or badly soiled, it is time to replace it with a new flag, and the old flag should be "retired" with all the dignity and respect befitting our nation's flag. 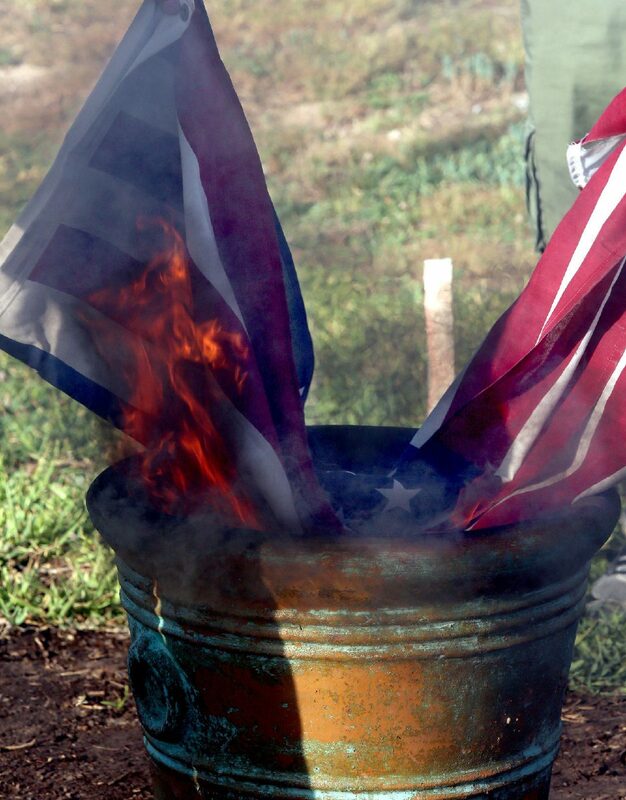 The traditional method of retirement is to incinerate the flag, but this does not mean that one should simply drop the entire flag (intact) into a fire. Webber researched the proper etiquette for retiring a flag and practiced with his troop a month before the event. In his research, he found that every ceremony was different. He recalls one video in which many folded flags were placed on an oversized one, which was then rolled into what Webber described as a “multi-layered burrito of flags” and burned. For this ceremony, the flags were unfolded, held up on display, refolded and laid into the fire. Webber did a free flag exchange at McAllen farmers markets, giving new flags to local residents who donated their old ones. Other flags came from Bentsen State Park, the Texas Department of Transportation, the Pharr Police Department and the McAllen school district. At the ceremony, he read the names of those whose flags were being retired. Troop 7 Scout Leader Jesse Ramirez said this project builds leadership for boys hoping to become Eagle Scouts, but Webber’s project in particular makes him proud. Ramirez served from 1983 to 1991 as an army sergeant, medic and practical nurse in Panama and the Gulf War. Ramirez said a flag retirement ceremony is equivalent to a person’s funeral. He said the American flag means something different to everyone, and this ceremony was one Boy Scout’s way of paying homage to what the flag means to him. To Webber, the ceremony was simply his duty as a Boy Scout.